If you stand on the bluff overlooking Saginaw Bay or stare at the mouth of the Pinnebog River and the crescent shaped lines of the bay hard enough you might catch a glimpse of ghosts of the past fluttering in the sunshine. If you listen closely, the ghostly pioneers of the vanished village of Port Crescent will tell you their stories in the whisperings of the wind and waves. The crescent shaped line of Saginaw Bay at the mouth of the Pinnebog River formed a natural harbor and provided a natural name for the new town - Port Crescent which Walter Hume founded in 1844. Walter came from Huron City to live among the Huron or Wyandotte Indians and he established a trading post and a hotel of sorts in his home for the occasional traveler. Woods & Company conducted a huge lumber business and opened a lumber camp at the mouth of the Pinnebog River before Port Crescent was founded. In 1851, three men by the names of Hanks, Buttars, and Thompson built a sawmill at the mouth of the Pinnebog River. Eventually the village covered 17 blocks with a population of more than 500 people. At first the settlers called their new settlement Pinnepog, but a post office established five miles upstream adopted the name Pinnebog and the two names and the two towns operated in a state of constant name confusion. Finally in 1864, the original town of Pinnepog changed its name to Port Crescent after the crescent shaped harbor that sheltered it and Jonas Learned was appointed the first post master. Industry in Port Crescent grew as quickly as a Lake Huron storm and soon the village had two sawmills, two salt plants, a cooperage that manufactured barrels for shipping fish and salt, a gristmill, a wagon factory, a boot and shoe factory, a pump factory, a brewery, several stores, two hotels, two blacksmith shops, a post office, a depot and telegraph office, and a roller rink. In 1866, another pioneer, Christian Schlegelmilch came to Port Crescent and built a grist mill near the mouth of the Pinnebog River. Christian was born February 20, 1824, in Prussia, to John and Mary M. Schlegelmilch. His father worked as a miller until he died in 1836 when Christian was only twelve. Christian took over managing the mill which his mother had inherited after his father’s death. When he turned twenty, Christian entered the 12th Cavalry Regiment of the regular German Army and served three years. After his discharge, Christian worked at his father’s mill until he and his mother sold it. In 1849, he came to America. First landing at Quebec, Christian voyaged up the lakes to Buffalo and then to Cleveland, Ohio, and finally to Rochester, New York where he found his brother. Pursuing an offer of employment in an Ontario flour mill, Christian returned to Canada and worked at the flour mill for five years. While he lived in Ontario, Christian married Elizabeth Billing on February 27, 1850, in Bowmanville. Eventually they had four children. After a five year stint in the Ontario flour mill, Christian came to Port Huron, Michigan and worked in shipbuilding, and then went to Lexington, Sanilac County, to spend three years working in the mills that Nicholas Wolfel owned. When Christian arrived in Port Crescent, the town had just a few settlers and a vast unbroken forest teeming with wild animals surrounded it. He called his grist mill Port Crescent Flouring Mills and used steam power to operate them, often producing 160 barrels of flour a day. Three months after Christian Schlegelmilch built his grist mill, it burned down, but he immediately rebuilt it. The flour manufactured at Christian’s mills gained county wide fame for its excellent quality. Christian owned four improved village lots in Hume and Meade Townships and 280 acres of farming land. In 1853, he lost $3,000 from a barn fire and its contents and in 1881, he also suffered another fire loss. A Democrat by political persuasion, Christian Schlegelmilch held various official positions. In 1884, he was elected Justice of the Peace and also served as highway commissioner for two years. There are still traces of the Schlegelmilch family in the Port Crescent Pioneer Cemetery which is located about one half mile east of M-25 on Port Crescent Road in Hume Township in Huron County, Michigan. Record 71 described a Julius Schlegelmilch who lived from 1916-1918 and Dorothy Schlegelmilch who was born and died in 1915. Local historians including June Nelson have transcribed epitaphs and established records of the Port Crescent Pioneer Cemetery for posterity. As well as supporting Christian Schlegelmilch’s pioneering grist mill, Port Crescent prospered as a lumber town from about 1864 to 1881. Bennett Haskell, salt and lumber manufacturer and general merchant, operated the Haskell Saw mill which cut the first lumber on the Pinnebog River and he owned a salt block as well. Bennett Haskell and his family came from a prominent Maine family who moved to New York in 1858 and to Whitehall, Michigan in 1865. After Bennett’s father, N.B. Haskell, worked in lumbering in Whitehall for two years, the family moved to Port Crescent in the spring of 1868. In partnership with Henry C. Spaulding of Elmira, New York, N.B. Haskell purchased a tract of land on the Pinnebog River where it emptied into Saginaw Bay and N.B. Haskell managed timber rafting operations. Their company controlled an extensive lumber trade on the Pinnebog River which flows into Saginaw Bay at Port Crescent, dealing in valuable pine. Every winter N.B. Haskell and his men cut from one to three million feet of logs. Bennett Haskell married Josephine Earl originally from Buckville, Ontario, at Port Crescent on April 9, 1875. She had been educated in music and taught music before she married Bennett Haskell. In 1880, the year that N.B. Haskell and his son Bennett became sole proprietors of the business, they established a salt block with the capacity of 200 barrels of salt when it operated at full capacity and built a 48x72 feet mercantile store. N.B. Haskell also owned about 4,000 acres of land, some of it still preserving fine timber, but most of it suitable for farming. He owned all of the village lots in Port Crescent lying north of Pinnebog Street. Eakins & Soule also manufactured salt and produced lumber in their saw mill as well as being general merchants at Port Crescent. Charles Soule, one of the owners of the firm, originally hailed from Vermont but moved to New York with his parents when he was one year old. He trained as a teacher, but after a short time teaching, he decided that he wanted to do something different, so he went into the lumber business and helped built many of the buildings in Cattaraugus County, New York. In April 1845, Charles Soule married Clarissa T. Rowley in Wyoming County, New York and they eventually had seven children. After several years in New York, Charles sold his business in New York and came to Huron County, Michigan, and established a saw and grist mill and a mercantile business in Lake Township. He built up a settlement and his public spirit and energy attracted many people and a government mail route. His settlement was called Soule and it grew rapidly enough to become one of the leading villages of the Lake County of its time. In 1880, Charles Soule joined the firm of Williamson, Eakins & Co., the successors to Woods & Company, manufacturers of salt and lumber. Their company produced about 150 barrels of salt block a day and their saw mill about 30,000 feet a day. Mr. Williamson resigned from the company in 1883 and it became Eakins & Soule. In 1880, President Rutherford Hayes appointed Charles Soule as postmaster at Port Crescent and in 1884, Charles served as Justice of the Peace. He was elected Probate Judge for Huron County in the November 4, 1884 election. He said that the sand at Port Crescent had peculiar characteristics which made it valuable for smelting copper and manufacturing glass. Boat loads of sand were shipped from Miss Haskell’s dock to copper smelters in Michigan’s Upper Peninsula to Tonawanda, New York and to the glass factories in Detroit and Cleveland. In 1884, The Directory of the Marine Interests of the Great Lakes: Comprising a Complete List of All Vessels Navigating the Lakes, Arranged Alphabetically described Port Crescent as a small village 60 miles northeast of Bay City an four miles southwest of Port Austin at the mouth of the Pinnebog River. The Directory fixed Port Crescent’s population at about 600. Travelers, businessmen and other patrons found no shortage of places to stay when they arrived at Port Crescent. Two of the most popular hotels were kept by two gentlemen named William - William Carter and William McCoy. William Carter, owner and manager of the Crescent Hotel at Port Crescent, began his life in Genesee County, New York on March 12, 1830. His parents placed him in the care of strangers when he reached five years old and he lived in various places until he turned twenty years old. At that point in his life he started to work as a carpenter and joiner in Ontario, Canada, and he worked in Ontario until he celebrated his 35th birthday. While William Carter still lived in Canada, he married Margaret Renney on March 20, 1855, in Grimsby, Ontario. She too was brought up by strangers because her parents died when she was still a child. The Carters became the parents of eight children. In 1864, the Carter family came to Port Austin and William worked as a saw mill assistant for Ayres & Company and in 1866, he bought 80 acres of unimproved land in Dwight Township. The Township affairs were in pioneer condition and William remained there for four years, improving his land and Dwight Township business. He owned the second horse team in the Township. In 1870, William Carter and his family moved to Hume Township to manage the farm of Jonas R. Learned of Port Austin, remained there for five years, and then he bought a farm of his own in the same section. He worked his own farm for six years and then in 1852, he purchased the hotel property. He operated the Crescent Hotel in behalf of the traveling public. A Republican in politics, William Carter served as a supervisor for one year and Clerk of Dwight Township ship for two years. He also served as Justice of the Peace for eight years, School Superintendent for four years, and School Director in Hume Township for five years. He was Superintendent of the Poor in 1884. The other William hotel keeper, William McCoy, owned and operated the Port Crescent House in Port Crescent. He was born on January 20, 1847, in Ottawa County, Ontario, Canada. His parents Thomas and Catherine were influential members of the agricultural community and William received an education in all branches of farming. He came to Michigan when he was 17 years old, and went to work in the lumber regions of the Pinnebog River for Leonard & Ayres. In 1868, he went to Grindstone City and worked as a turner in Wallace & Company. A skillful an effective turner, he earned high wages and operated there for eleven years. On December 17, 1871, William McCoy married Bridget A. Carr in Buckingham, Quebec. Bridget was well educated and taught in the common schools for seven years before her marriage. The McCoy’s had two children, Mary and Thomas. Bridget died at St. Mary’s Hospital in Detroit on March 4, 1880 of a tumor. William McCoy remarried on June 20, 1882, this time wedding Mary Donnelly in Pontiac, Ontario. As well as working as a turner, William McCoy still farmed and after managing a farm in Port Austin Township for two years, he came to Port Crescent in the spring of 1882 and bought the Port Crescent House. A Democrat in political conviction, William McCoy held minor local offices in Port Austin Township and he also retained ownership of 120 acres of land in the Township. The pioneers of Port Crescent were far removed from hospitals and most doctors, so they highly valued the doctors who lived and worked among them. Dr. James Eakins came to Hume Township in 1869, and was the pioneer physician of the Township. People often walked 15 to 20 miles to see him, since there were no telegraphs, telephones, or automobiles in that time and place. Dr. William E. Spohn, physician, surgeon and druggist, lived in Pinnebog, Hume Township. He was born February 4, 1851, in Ontario and he obtained his early education there. His parents, Asbury and Mary Spohn, moved from Canada to Hume Township in 1860, when William was nine years old and he grew up with the country. William Spohn attended the graded school at Port Austin for two years and taught there for six months. After teaching six months, he again attended the same school for three months. He taught for two more years and in 1876, he began the study of medicine with Bennett Richard, M.D. at Port Austin. He continued to read medicine under Dr. Richard’s mentorship and then entered the Detroit Medical College for two terms, completing his course and graduating with his credentials in 1881. Immediately establishing his practice at Pinnebog, Dr. Spohn enjoyed much success and his business as a druggist also thrived. On December 5, 1882, Dr. William Spohn married Sarah E. McDowell at Royal Oak, Michigan. Born on May 16, 1860 in Royal Oak, Sarah was the daughter of Peter and Sarah Hart McDowell. Politically, Dr. Spohn endorsed Republican Party views. Dr. Ford W. Sellers was born in Canada in 1852, and immigrated to the United States in 1880. He practiced medicine in Pinnebog and Port Crescent, Michigan, for many years until he moved to Meade in Huron County, Michigan. The 1910 Census shows 58 year old Dr. Sellers living in Meade with his wife Mary A. Sellers, 56, their daughter Jessie 32, and their son Roy 29. Did the Village of Port Crescent Really Vanish? The timber boom in the Pinnebog River basin played out by about 1881 and the brush and wildflowers began to slowly creep to reclaim the farms and fields. The town authorities moved the solid buildings to other towns including Port Austin, Kinde, and Meade. Nathaniel Bennett Haskell, a third generation owner of the sawmill and salt plant on the west side of the Pinnebog River, began to export white sand to be used to manufacture glass. The company exported sand until 1936. After World War II, increased demand for public use areas along shoreline property created a need for an additional state part in Michigan’s thumb. On September 6, 1959, the State of Michigan officially established the 600 acre Port Crescent State Park on the tip of Michigan’s thumb. The park lies within Hume Township with Port Austin, the nearest community, about three miles northeast of the park on M-25. The vanished village of Port Crescent which lies at the mouth of the Pinnebog River is part of the Port Crescent State Park. Port Crescent hasn’t totally vanished. Here and there old building foundations protrude like dinosaur bones and shrubs and flowers grow where homes once stood, themselves standing as if waiting to meet the encroaching weeds, brush, trees and sand that will eventually bury the remnants of the village. The old Port Crescent Road Bridge which years ago led into the village of Port Crescent is now a bridge that leads nowhere. One of the last physical remains of Port Crescent, the bridge crosses the old Pinnebog River. The lower ten feet or so of the old sawmill chimney makes up a prominent part of the entrance to the Port Crescent State Park. McDonald, David A. and Schneider, Marilyn. Celebrating 150 Years, Huron County Michigan, 1859-2009. Huron County Historical Society. Nelson, June. It Happened Here One Spring, the Centennial Celebration of Port Crescent, Michigan. 1968. 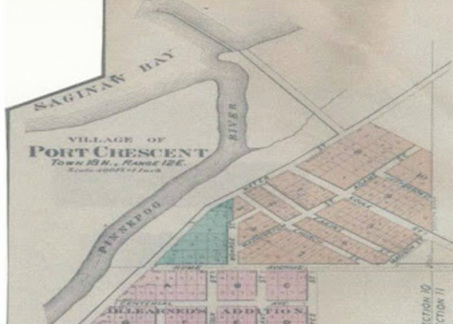 A centennial history of Port Crescent Vanished Lumbering Village 1868 - 1968. State of Michigan Eighteenth Annual Report, Bureau of Labor and Industrial Statistics. Joseph L. Cox, Commissioner of Labor, 1901.